Anita Crook, 46, works for OHFT at the NHS Fiennes Centre in Banbury. She works alongside her colleagues supporting patients in the community in Banbury and surrounding villages with the aim of preventing illnesses from becoming more serious, so keeping people out of hospital and in the comfort of their own homes. Anita has been a care worker since she was 18. She moved into her current role more than two years ago and is also studying for a foundation degree learning new clinical skills to become an Assistant Practitioner. 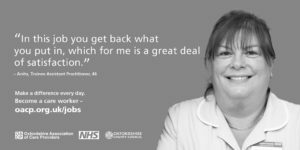 She said: “My current job allows me to use my clinical skills and to communicate with patients – both these aspects of my job are very important and if they help make a patient more comfortable even for one day that is great. “In this job you need to develop relationships with patients so you can sit down with them, listen to their needs and provide the support they want. I think the key qualities are understanding, patience and flexibility. “I really would recommend this job to other people because I’m not stuck in an office and I have a great deal of autonomy to carry out my varied tasks as part of a hard working team. I definitely feel valued and appreciated by my colleagues who support me with my job and my studies – they have been brilliant. “In this job you get back what you put in”. Find out more about Anita’s story.